When I first created this recipe, the concept of salty desserts was in its infancy, so some people thought I was going crazy with this recipe. It’s my take on the classic Mais con Hielo, and the sweet and salty combination is something you will love. If you’re looking to replace corn, saba bananas or sweet potatoes would do well here, just chop them into small pieces and skip the step of putting it in a blender. In a pot, boil corn, water and sugar for 15 minutes until corn kernels gets soft. Set aside 2 tbsps of corn kernels and blend the rest in a blender or food processor. Let cool. Boil the 500 ml evaporated milk together with nutmeg, star anise and rock salt. In a bowl, sprinkle gelatin over coconut milk and let stand. Pour boiled milk over coconut milk and mix well. Strain the liquid and pour into individual ramekins or serving glasses and let set in the ref, about 4 hours. 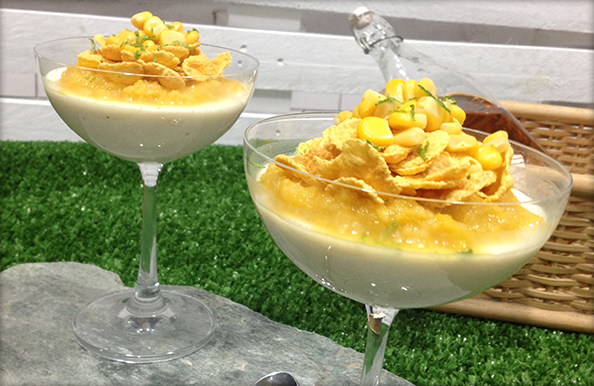 To serve, spoon some corn ragout over panna cotta, garnish with corn flakes and saved corn kernels. Grate chocolate over everything.